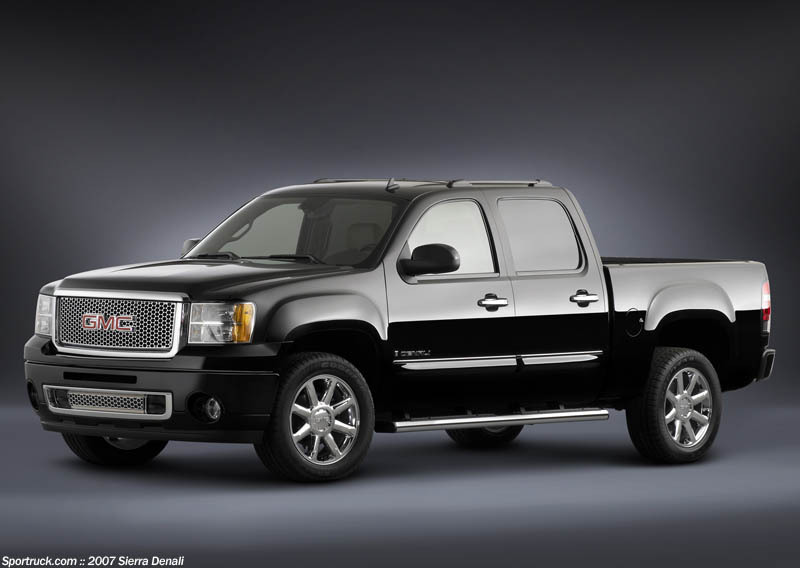 The new GMC Sierra Denali represents the highest level of the new 2007 GMC Sierra truck lineup. 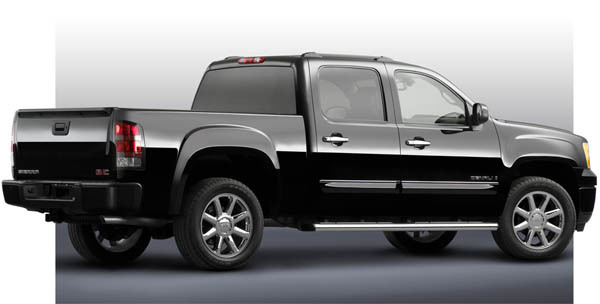 Available exclusively as a crew cab model, the new Sierra Denali is a distinct model with many features not available on the regular Sierra pickup. 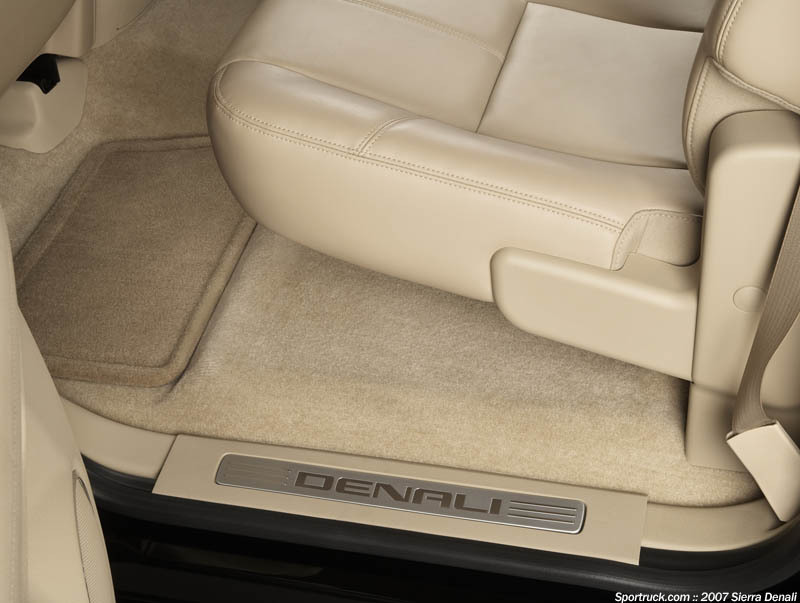 The Denali is set apart in both power in style, and freely exhibits both in excess. 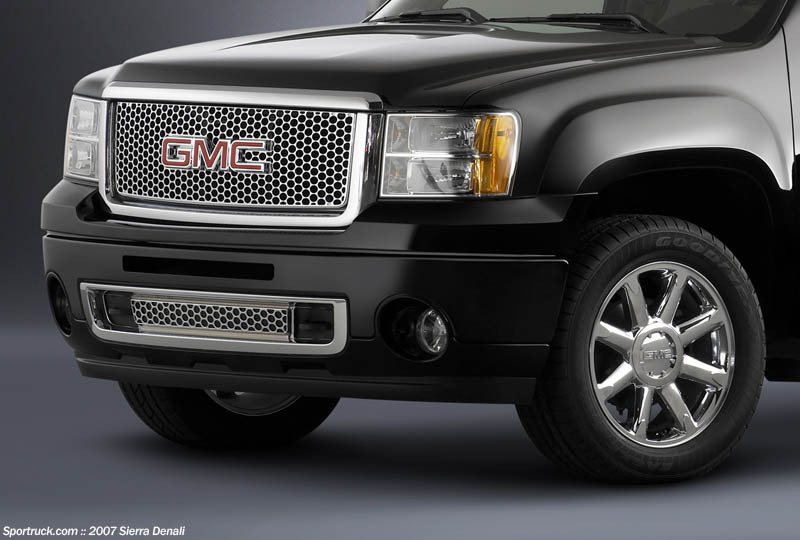 Outside you will find the immediately recognizable Denali chrome grille that distinguishes this from other run of the mill pickup trucks. 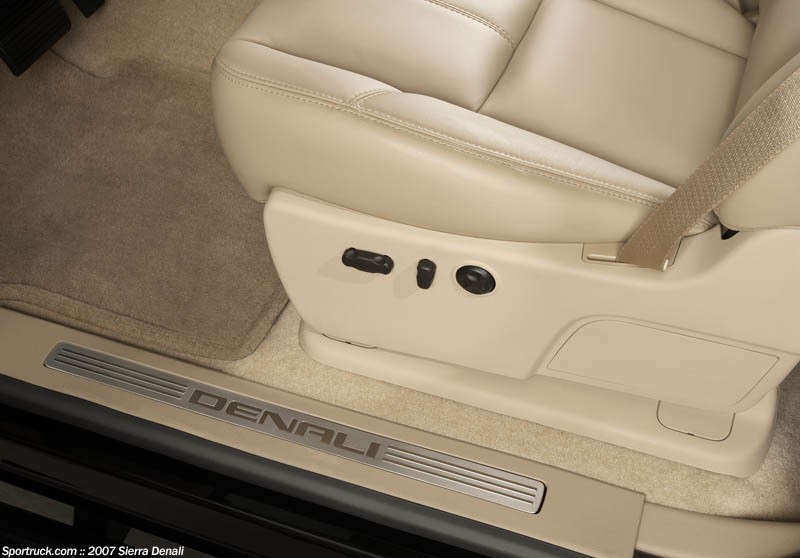 In case the grill was not enough, Denali front door badges are provided to clue in the uninitiated. 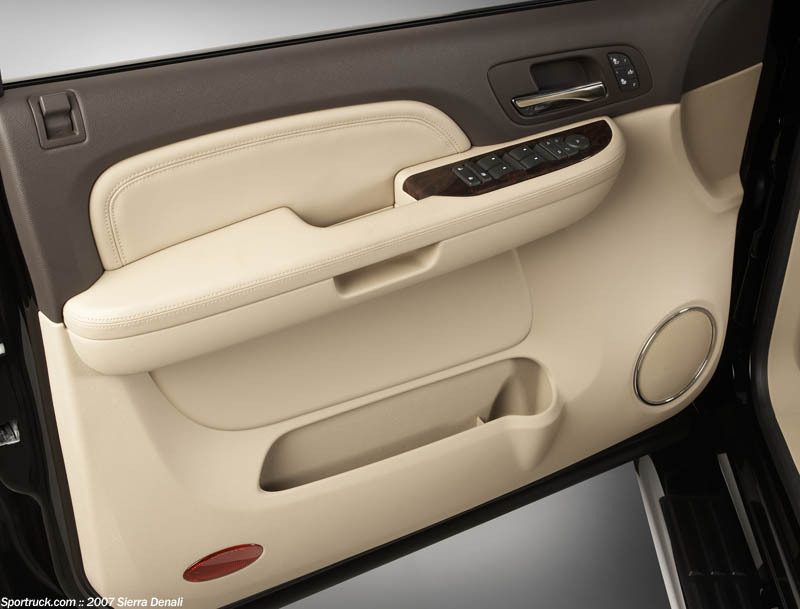 Additional chrome door handles and trim adorn the truck, while body-color bumpers give the exterior a refined elegance. 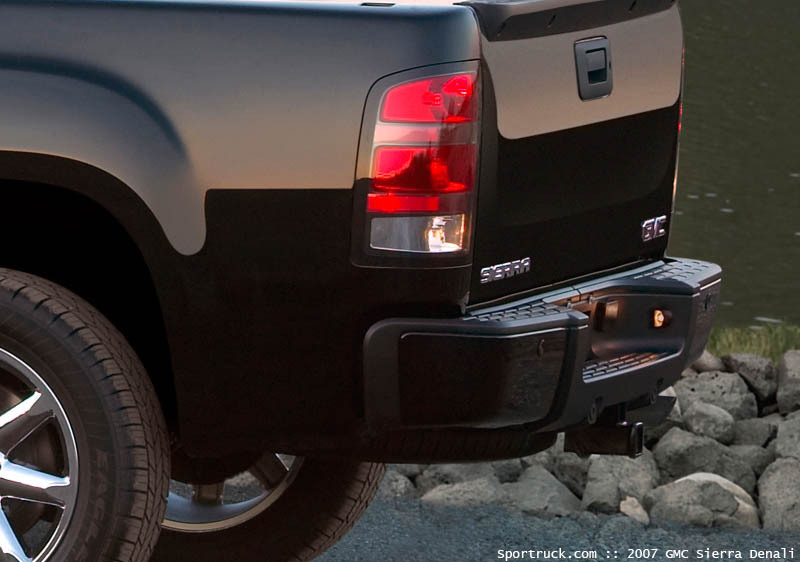 The Sierra Denali also features its own tail lamp styling with clear outer lenses over red tail lights. The Sierra Denali is available three shades: Onyx Black, Olympic White and Fine Silver Birch Metallic. The Sierra Denali backs up its good looks with equally great power. This glorified truck is powered by the ultimate 400-horsepower 6.2L all-aluminum V-8 engine with variable valve timing, and is the only pickup to receive this powerplant (also found in the GMC Yukon Denali and Cadillac Escalade). The engine is rated at 400 hp and 415 lb.-ft. of torque, and is backed by a new six-speed automatic transmission. The powertrain is available in either 2WD or all-wheel drive configurations. 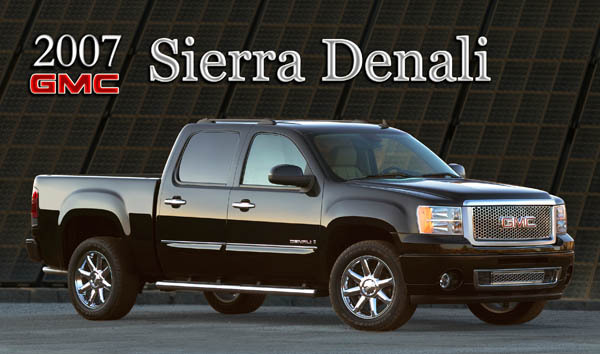 The Sierra Denali comes standard with 18x8 polished aluminum wheels wearing 265/65/18 tires. Larger 20x8.5 chrome wheels with 275/55/20 tires are available as an option. The chassis features the standard Z85 suspension, or the optional Z60 sport suspension when equipped with 20-inch chrome wheels. Four-wheel disc brakes and StabilTrak are standard, along with skid plates and tow hooks. 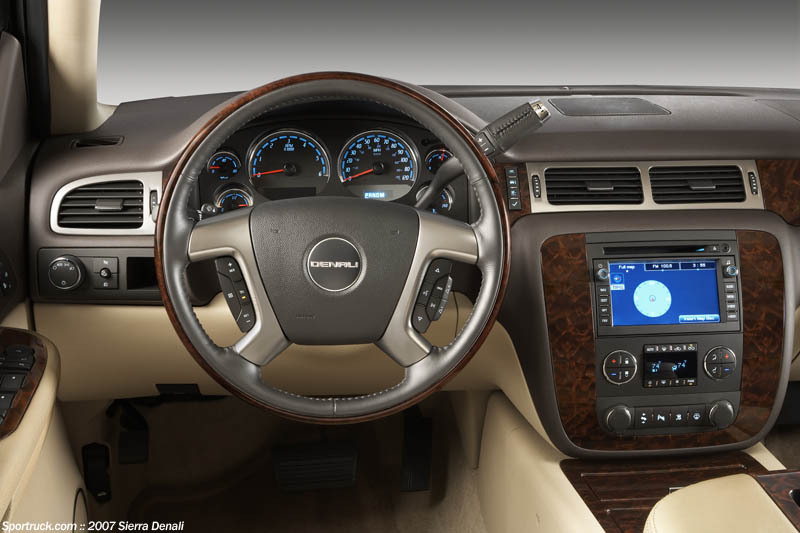 Inside, the Sierra Denali offers a combination of style and luxurious appointments, many exclusive to the Denali model. 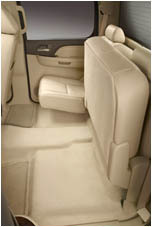 The leather front seats are heated, with 12-way power adjustments and four-way power lumbar support. 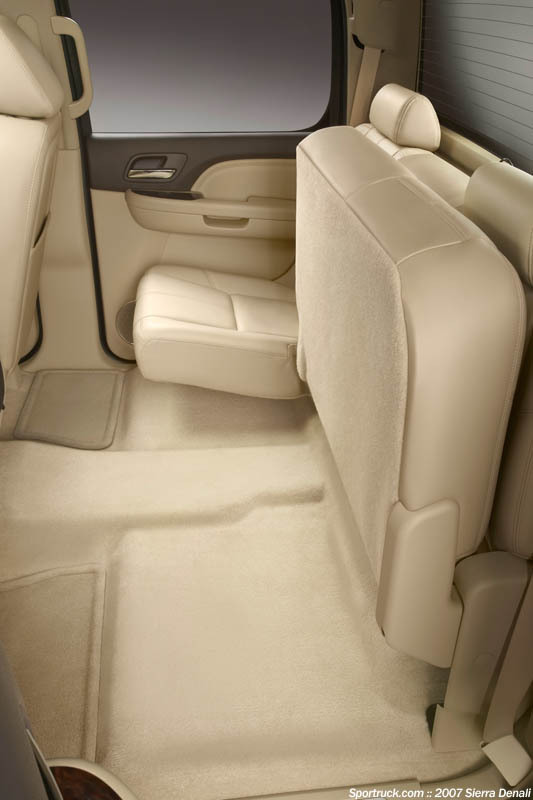 The rear seats are also trimmed in leather, and offer a 40/60 folding feature to maximize interior utility. 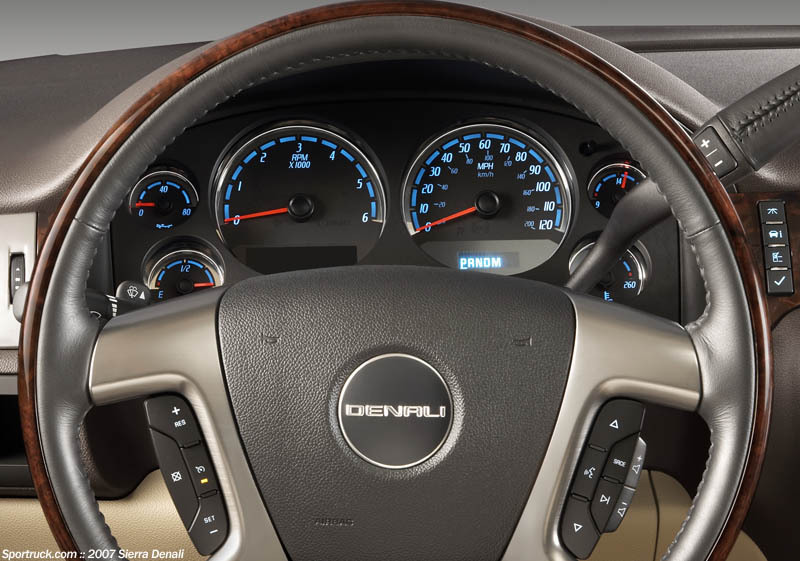 The Denali-exclusive leather-wrapped steering wheel features wood accents and wheel-mounted audio controls, and a heated steering wheel is optional. 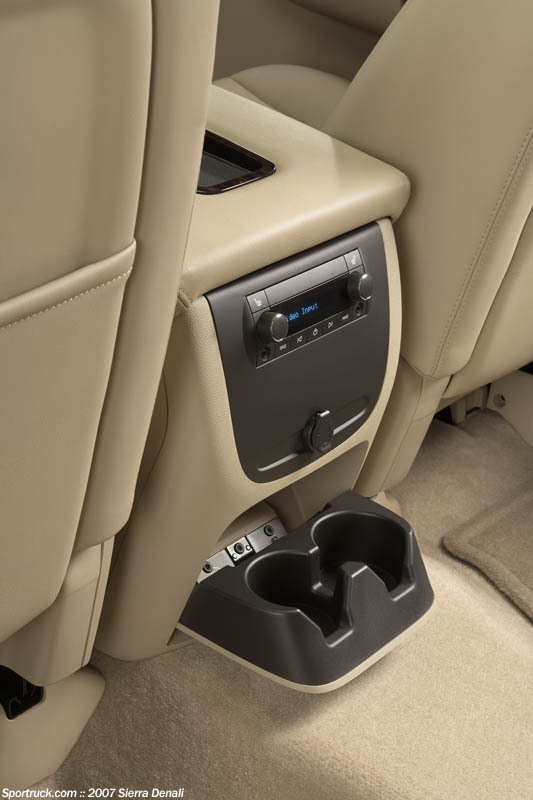 Between the front seats you will find a unique center console with wood grain trim on the lid and cup holders. The Sierra Denali also features bright sill plates embossed with the Denali logo to dress up both front and rear door openings. 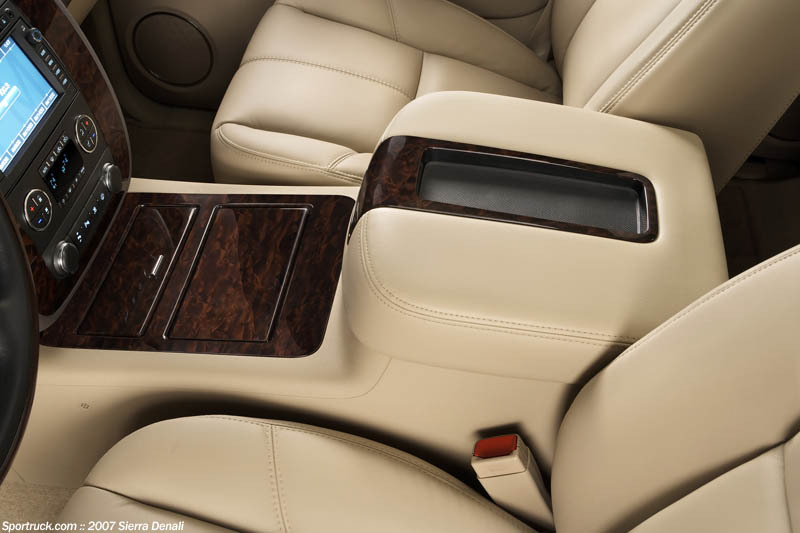 The interior is available all-Ebony or an exclusive Cocoa/Light Cashmere combination. Electronics include unique instrument panel cluster graphics, a universal home remote, AM/FM MP3-capable radio with six-disc in-dash CD changer, Bose premium sound system, rear seat audio, XM Satellite Radio, electro-chromic auto-dimming inside mirror, dual-zone automatic climate control, and power-adjustable pedals. The Sierra Denali features a host of safety and convenience equipment, including roof-mounted side curtain air bags, the latest OnStar generation 7, RainSense automatic windshield wipers, heated windshield washer fluid system, remote vehicle starting system, EZ Lift tailgate with lock, and Ultrasonic Rear Parking Assist, and tire pressure monitoring system. 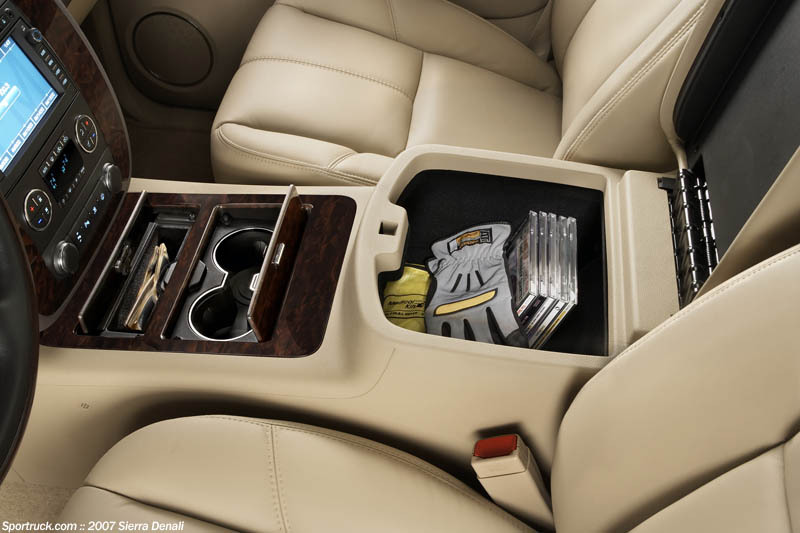 Even with so many features standard, there are some options available on the new Sierra Denali. 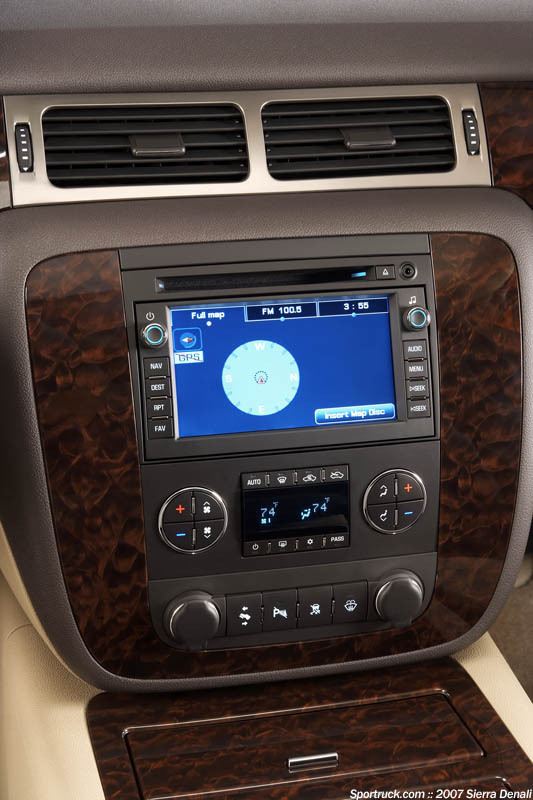 These include a cargo management system for the bed, power-sliding rear window, rear window defogger, roof rack, navigation radio system, a power sunroof, a rear-seat and a DVD-based rear-seat entertainment system and an engine block heater. The 2007 GMC Sierra Denali features GM’s new five-year, 100,000-mile powertrain warranty, including courtesy transportation and roadside assistance for the duration of the warranty. 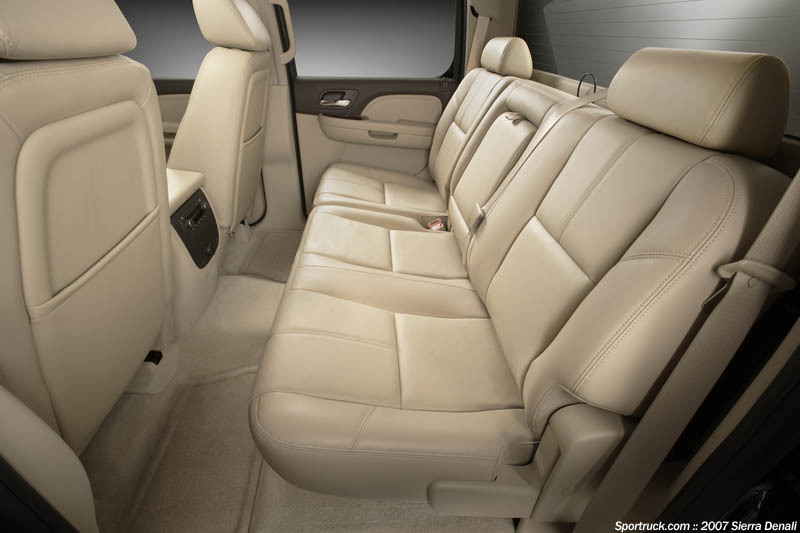 If you think you can handle all the power, luxury, and utility GMC has packed into the new 2007 Sierra Denali, you can get yours at a local GMC dealer in first quarter of 2007.